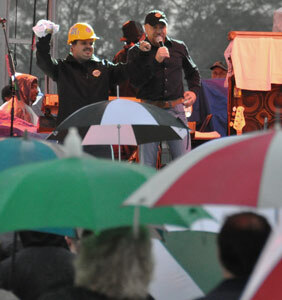 Thousands stood in the rain in Rip Hewes Stadium Saturday to listen to Ronnie Gilley speak about the Country Crossing development project. The plans for the country music entertainment complex were threatened recently by the formation of a Task Force to Stop Illegal Gambling by Governor Bob Riley. The plans for Country Crossing are based on electronic bingo as an economic facilitator to help fund the music park development project and bring it to completion. The rally was held because the Governor's Task Force on Illegal Gambling was perceived as a direct threat to the project. 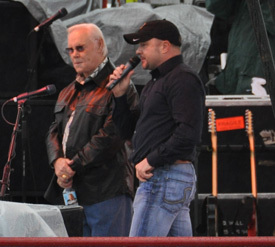 With George Jones at his side, Ronnie spoke for about an hour about how Country Crossing would bring change to Alabama and to Houston County. Ronnie pointed out that with any change comes controversy. "We've been under continuous attack from a select group since starting the Country Crossing development project. We're going to stay focused and we're going to bring the project to fruition, I promise you that." said Ronnie Gilley, "I need to let everybody understand that with this project, obviously, our focus is on entertainment." Ronnie went on to explain how the project would be impossible to bring off without electronic bingo. He also explained how, with bingo as an economic facilitator, Country Crossing would bring about a major expansion of trade and commerce not typical of the traditional electronic bingo operation. Ronnie read a letter he plans to send to Governor Riley that pretty well sums up the situation with the Governor's threats to the project and the economic expansion in Southeast Alabama. Read Ronnie's letter to Governor Riley here. Ronnie clearly stated that the scope of the the project is not bingo, the scope of the project is a country music entertainment complex that will rival and surpass Branson Missouri. Ronnie expanded on the viability of the the project and the economic expansion it will bring to the area by comparing it with Branson. Branson has 18,000 hotel rooms fully occupied year round. Branson has 62,000 dinner theatre seats fully occupied year round. Branson was visited by 7.8 million people last year, generating 7.8 billion in revenue. Compared to Branson, here's why Country Crossing will do so well and bring economic expansion to our area. Find Dothan Alabama area businesses and locate them on a map... Plan your shopping trips. We list all businesses, not just advertisers. Be sure to stop by our Dothan Alabama Opinion pages. Learn what is on your Dothan Alabama neighbors' minds and share your own comments and opinions.